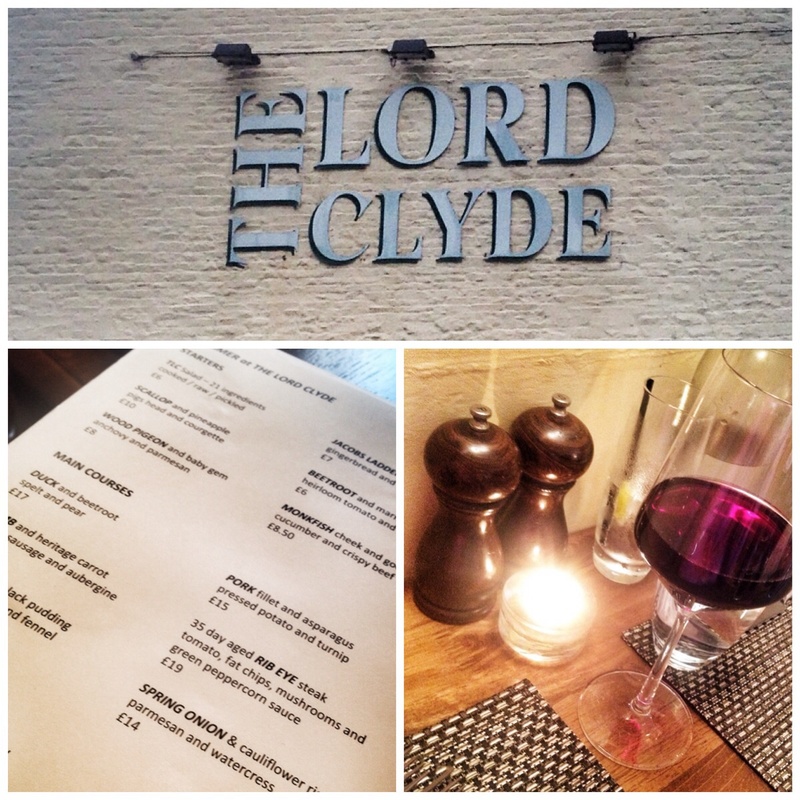 I’ve long wanted to try The Lord Clyde. Pretty much ever since I found twitter the incredible images emanating from the @erniechef handle have had me all of a quiver. Further reviews have merely added to my need to try. And so it came last Saturday. The Flame was in need of attention. The Cooktwit had bagged a weekends golf in Blackpool. As part of the ‘Brownie point’ totalising system that all men run, a trip of epic proportions was called for. Step forward ‘The Lord Clyde’. Not that The Flame had ever heard of it. Some might suggest it was me that wanted to try it really, but I’m not having that! The Lord Clyde (or ‘TLC’ going forward!) was a humble pub set in a village outside Macclesfield called Kerridge. 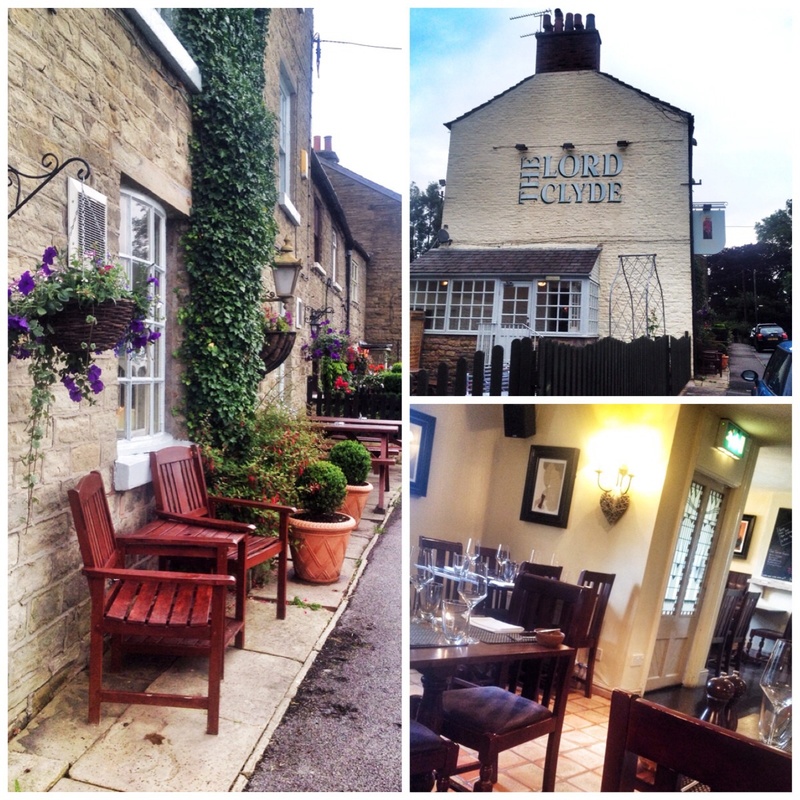 It’s still set in Kerridge, but under the talented wings of Chef Ernst and hospitality guru Sarah since July 2013, it has slowly transformed into an award winning restaurant. Ernst, born in Cape Town, South Africa sports an impressive cv. From age 18 he’s cooked his way through various hotels and chipped in a stint or two at a host of top restaurants including The Fat Duck, Restaurant Noma, Le Manoir aux Quat’Saisons. It’s an hours run for us. And I drove both ways! (Serious brownie points then? – Ed). We entered what effectively is a small country pub. It is rurally set. Slewed at the end of a row of terraced houses it has that air of work in progress. We entered thorough the small doorway at around 6.30pm, so we were pretty early. We announced our arrival and set ourselves down to the left in the ‘pub’ side. A half (half!!! – Ed) of ‘Cheshire Cat’ calmed the nerves. Being honest at this point we wondered what we had done. We were the only ones in and felt as though we were intruding a bit! That said we were hungry and needed fuel. The plain, easy to read, black on white menu was now in our grasp. A pleasant waitress trooped over and skilfully described in perfect detail what we could expect when ordering some of the combinations on offer. Scallop, pineapple, pigs head and courgette anyone? It is an unusual menu, but I was already struggling what to chose, it all sounded amazing to me. After choosing our extravaganza we were shown across the room to our bijou table pressed against a wall. We wondered how we would be able to fit the food on! We needn’t have worried though, our service was impeccable throughout and no extraneous hardware was left to settle more than a few moments. The decor is spartan. There are no trees, neon lights, industrial ironmongery here. 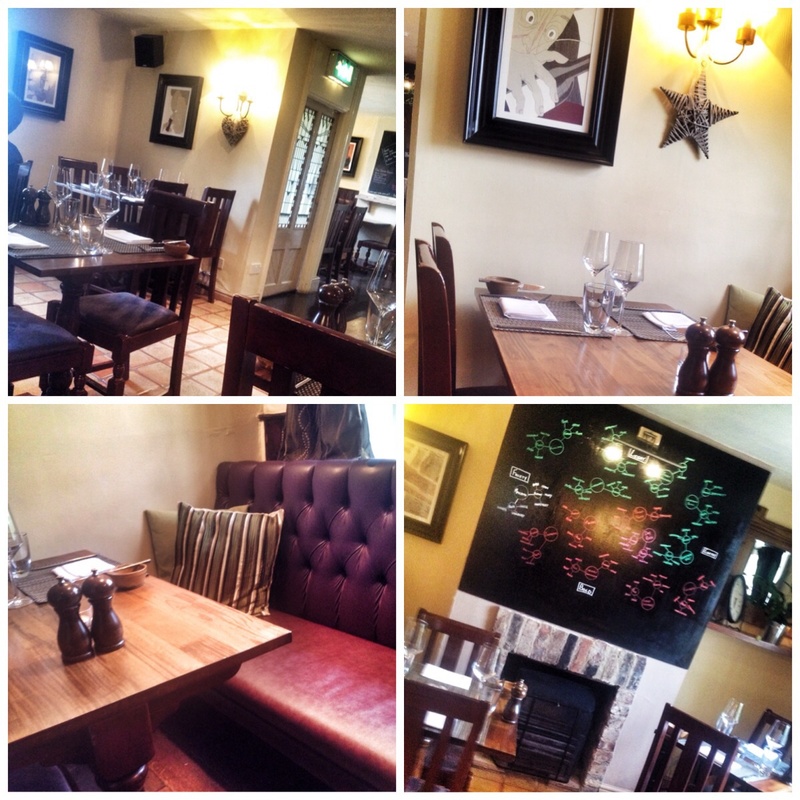 Simple painted walls, dark wooden furniture, tiled floor with a few pictures. I sensed a few softer touches would help. 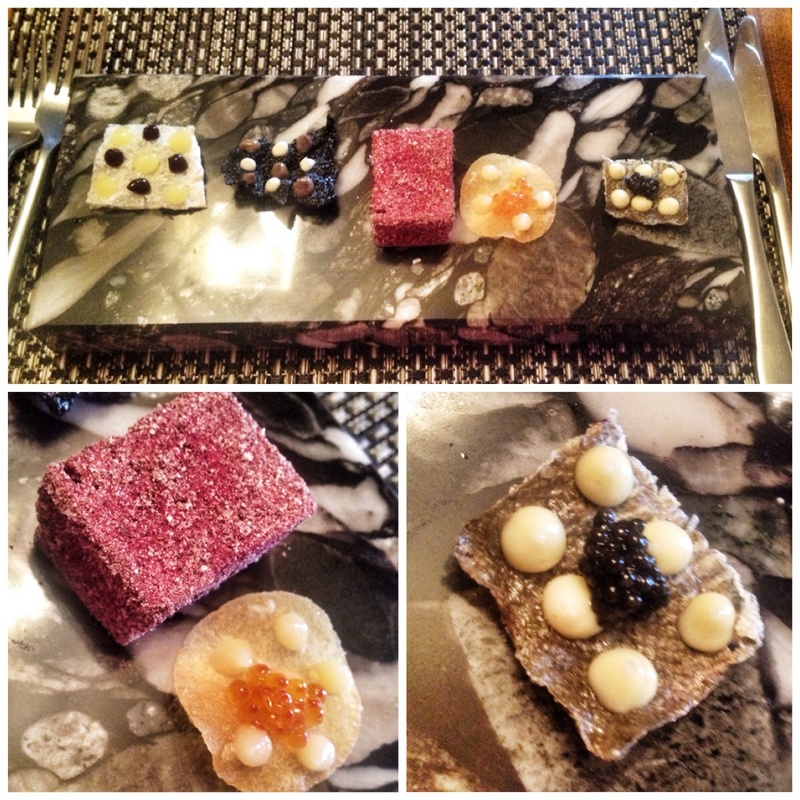 Out of the blue popped two granite slabs, each topped with an array of crispy, colourful morsels. The flavours became stronger moving across left to right via a beetroot and feta marshmallow to a cod and chip crisp! It was a startling pre amble to our chosen cast. Next up the bread! Home made soda bread, served warm in a hessian sack! A miniature cauldron of smoked butter, (complete with real smoke) a heap of sea salt and my favourite, beef dripping. These all sat alongside on their own slate. It was stunning, particularly with the dripping. Then came the real starters. Having agonised over the TLC Salad – 21 ingredients raw; cooked and pickled, The flame finally settled on the Monkfish cheek, gooseberry, cucumber and crispy beef – £8.50. She was a little disappointed with this to be honest. The cheek was diced raw which wasn’t expected. I managed a fork full and loved it. Fresh fishy taste with a sweet fresh relish. Mine though, as nature intended was raw. Jacobs Ladder (short rib of beef), allium, gingerbread crouton and coriander – £7.00. I’ve been looking out for steak tartare and it’s variants lately, I had some in Sicily recently and again at Salvi’s in Manchester. I’m starting to acquire the taste for it. This was as good as I’ve had so far. A lovely ‘oniony’ side kick to the wonderfully cured beef. The gingerbread croutons added texture and a neat sweet kick, a great start. After a comfortable gap the mains swept in. The flame went fish again. Turbot, black pudding, palourde clams and fennel – £19.00. A wonderful slab of beautifully cooked white fish was topped with a black pudding crumb, set on fennel cooked several ways. To add drama a swoosh of fish sauce was added just before consumption. I managed a quick fork full, before the flame took charge. She mopped up the jus with our hand cut chips (£3). Flaked, translucent the fish tasted superb, the black crumb adding a meaty edge. The flame gave it the thumbs up. 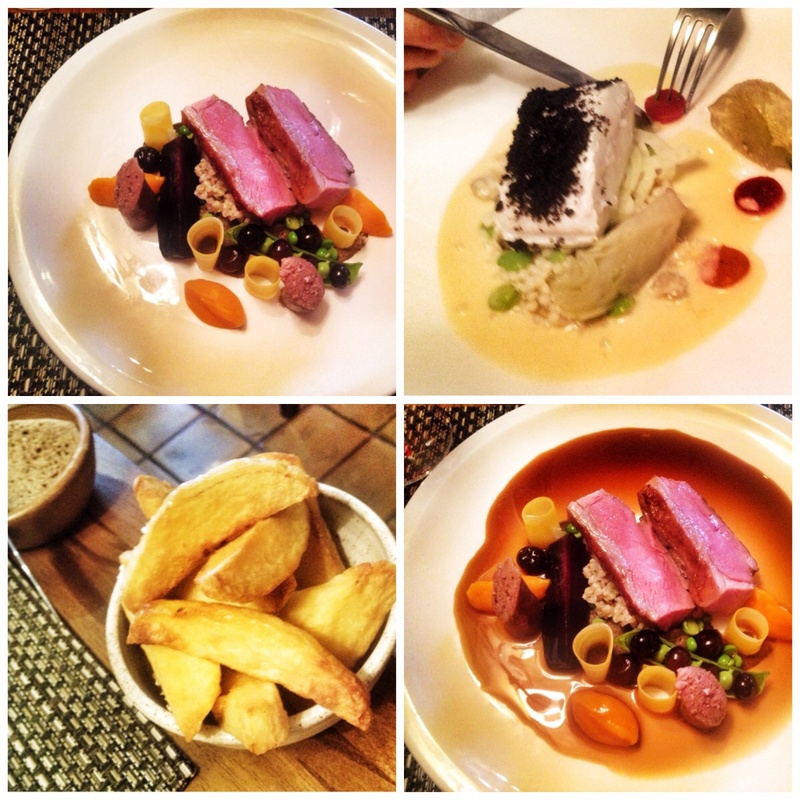 I went for the Lamb, heritage carrot, spiced sausage and aubergine – £18.00. I love lamb it’s my favourite meat. This was as good as I’ve had. Two beautifully pink tranches of (sous vide?) meat, juicy and tender requiring the merest touch of a knife to break a glorious mouthful from the main portion. Cuminised carrot purée, soft wedge of beetroot, peas and cherries in the pod added a crunchy touch. A tangy, luscious jus was washed round prior to the first morsel hitting the palate to add even more flavour. A wonderful main. We both went for dessert. 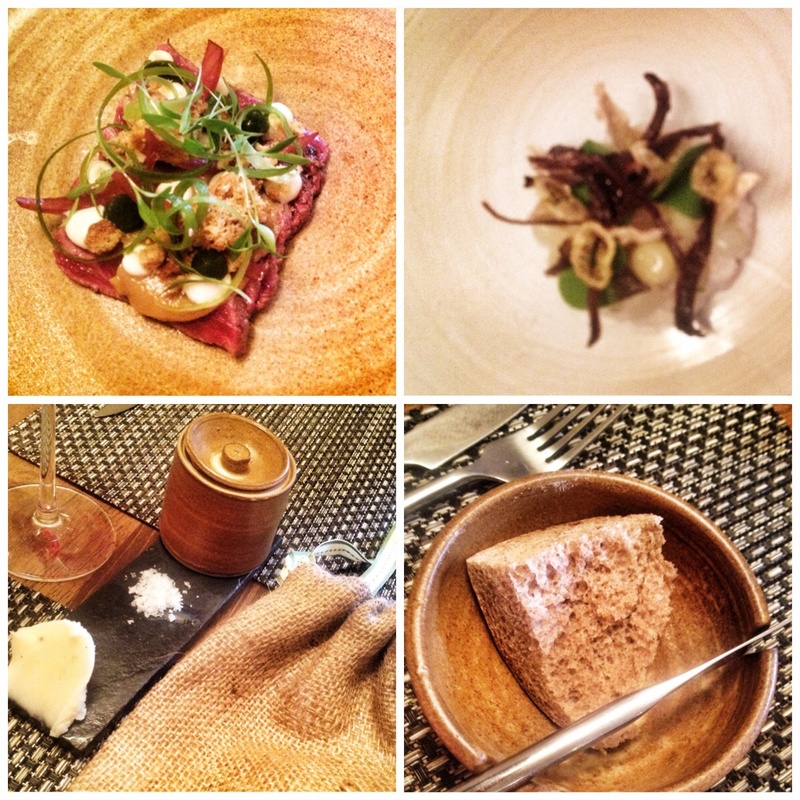 They sounded as off beat as the previous courses, but intriguing all the same. The flame loving apricot went after careful consideration for the Apricot, buttermilk, malva pudding and rooibos – £7.00. The apricots had been steeped in tea and served up with a moist spongey ‘cakette’, a sour, creamy swirl and some foliage. She loved it, exquisite flavours, I managed a touch of the buttermilk cream!! I went for a peach. I fancied the granola bit. 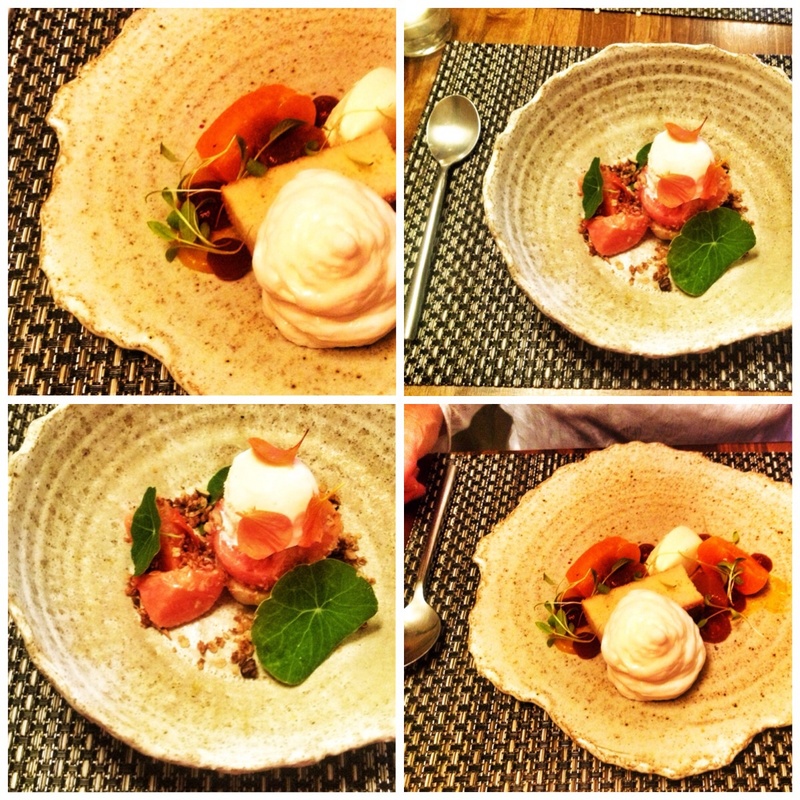 Peach, granola, pudding rice and nasturtium – £7.50. Beautifully presented in a half eaten earthenware bowl I wolfed it in seconds, including the flowery leaves! The pudding rice had a more solid feel than I was hoping and took a minor edge off my expectations. Still the drama of it all made up the deficit. We had a mug of coffee each to end, some petit fours would have been nice after the start but hey a minor quibble. All in all a cracking meal. It all came in at £88. I reckon when you consider the variety of textures and flavours on offer and the dedication involved to present food in such a beautiful way it is was a bargain. I’m sure you’d pay much more in London for this! The service by Sarah and the team combined with an awesome engine room headed by Ernst deserves to make its mark. The plaudits I’m sure will keep on coming. Kerridge is indeed blessed with a unique asset. Long may it remain and flourish.